As we approach the anniversary of the speech that inspired this blog (link here), I’d like to take stock of developments and make the case that the UK and Japan are on track towards a relationship that deserves to be called ‘a new type of alliance‘. Japan and the UK may not be allies today in a sense they were a century ago, nor in the much stricter sense that they have a formal agreement to mutual defence, but neither of those facts excludes the possibility that they are allies in a new type of alliance. I argue here that the notion of a ‘new type of alliance’ raised by HE Hayashi Keiichi in 2013 is not just a gimmick. While the essential nature of alliance may be timeless, the character of a specific alliance will be influenced by various conditions particular to the environment of the time. Times change, but have our assumptions about what constitutes an alliance kept up with recent changes in the environment of international security? Some examples illustrate how loosely these conditions have come to be applied -Example 1: Are the US and Japan allies? America is committed to come to Japan’s aid if attacked, but Japan (even given recent re-interpretations of policy in Tokyo) is not pledged to defend America. Japan does provide bases and money, but the bargain is more committed on one side than another. Nevertheless, no one argues that Japan and the US are not ‘allies’. At least, not any more. Until 1981 Japan avoided using the term ‘alliance’ to describe the relationship and even the choice to do so in the height of the Cold War was very controversial (link, link). This just shows that use of the word is as much or more a politically determined choice as it is a matter of objective fact. Example 2: NATO. Sure, Article 5 pledges allies to consider an armed attack on one as an attack on all, but ‘considering’ only gets you so far. It still leaves it up to each ally to decide individually what kind of assistance it deems necessary to offer. Example 3: US and Israel – no written agreement exists detailing the nature of the commitment, which is also not mutual. Example 4: In 1902, Britain and Japan were joined in an alliance that lasted for almost 20 years. What was the bargain in that case? A recognition of each-other’s interests’ in China and Korea, mutual ‘Promise of support’, ‘declaration of neutrality’, ‘Promise to communicate frankly’. These are not so very far from what we see today. 2004 January – the Defense Ministers signed Memorandum Relating to Defense Cooperation to develop bilateral defense exchanges. 2006 – RUSI and the National Institute of Defense Studies (NIDS) initiate Fellowship exchange programme based in RUSI’s London office. 2011October 31st – UK Minister of Defence Philip Hammond visits Tokyo to discuss Defence Cooperation agreements with counterparts in Tokyo. December 27th – Japan amends its Guidelines on the Overseas Transfer of Defence Equipment, opening up the possibility of trade and R&D cooperation that had been denied under the previous guidelines. April 10th – UK Prime Minister visits Japan and signs intergovernmental agreement to look into future partnering in the defense research and development sectors. to explore ways to further strengthen our security and defence cooperation, including joint exercises, training and unit to unit affiliations. Mutual pledge to deepen the existing dialogues between relevant Ministers and senior officials, to address the above mentioned issues in a joint effort to promote international prosperity and security. 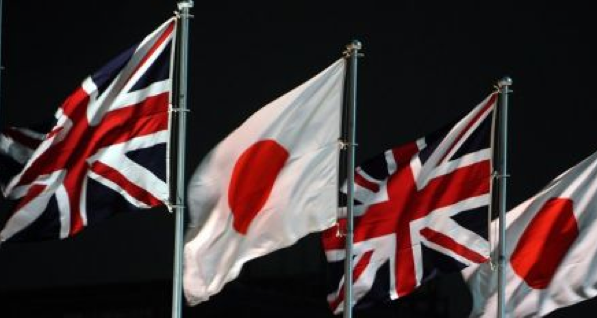 June 3rd – UK and Japan exchange a memorandum to strengthen defense cooperation in various areas including cyberspace. October – Japan’s Foreign Minister visited the UK for the First Japan-UK Foreign Ministers’ Strategic Dialogue. October – RUSI launches in Japan. The idea of the trans-Eurasia alliance between Japan and Europe or Japan and UK “would make the world a more stable place” said Dr. Chiaki Akimoto, the head of Royal United Services Institute (RUSI) new Japan office, at the RUSI Japan office launch. i) In the wake of close bilateral cooperation in dealing with the recent terrorist attack in Algeria, the two countries should continue strengthening cooperation, recognizing the importance of international cooperation in counter-terrorism measures. ii) The two countries should study the installation of a video hotline between the two prime ministers’ offices as suggested at this year’s UK-Japan 21st Century Group meeting. iii) After Prime Minister Abe explained Japan’s economic measures, the two leaders reached an accord to cooperate in Japan-European Union (EU) negotiations on concluding an Economic Partnership Agreement (EPA) for further strengthening of economic relations between Japan and the United Kingdom. June 20th – Chatham House conference (opening their five-year UK-Japan Global Seminar), British MP Hugo Swire called Japan Britain’s ‘closest partner in Asia’. His counterpart at the Conference, Hiroaki Fujii, had earlier called the UK ‘Japan’s ‘most important partner in Europe’. July 4th – UK-Japan sign “Agreement on the Security of Information” and “Agreement on the Framework of Defence Equipment”. September/October – PM Abe gave a speech at RUSI where he defined the UK and Japan as ‘a priori partners’. Nov/Dec – HMS Daring visits Japan. One of the UK’s newest and most advanced ships, the type-45 destroyer HMS Daring arrived in central Tokyo on Sunday 1, stayed for three days. November 27th – exchange of Liaison Officers between HMS Illustrious and MSDF ship DDS Ise to support bilateral coordination for HADR operations in the Phillippines (link). December Admiral Sir George Zambellas KCB DSC ADC DL, First Sea Lord and Chief of Naval Staff UK visited Japan, speaking at the JMSDF Staff College on Tuesday, 3 December 2013.
i) Japan and the UK agreed to “start negotiations on an Acquisition and Cross-Servicing Agreement [ACSA] (a military logistics support agreement to provide logistic, technical, and administrative support to each other’s forces) at an early date and hold their first ‘2+2′ foreign and defence ministerial meeting. An ACSA will mark a major step forward in the relationship, in particular if the current Japanese Government succeeds in its plan to interpret the exercise of the right to collective self defence as compatible with the current constitution. ii) Abe and Cameron’s joint statement added that they would “examine the opportunities and develop proposals” to make joint contributions to international peacekeeping efforts, military exchanges, joint exercises, operations and support, and “establishing a new mechanism to share information and analysis that supports the purposes of our co-operation” (link). May 2nd – Vice Parliamentary Minister of Defence Kihara Minoru gave a speech at IISS entitled “Japan and the UK as strategic partners – toward further co-operation in the defence field” (link). Call to strengthen the UK-Japan relationship as a ‘trans-Eurasia relationship’ to compliment the trans-pacific relationship (Japan-US) and trans-Atlantic relationship (UK-US). Judging by these recent developments, how does the UK-Japan relationship correspond to the characteristics of ‘alliance’ that should be applied today? What are the main features of the 21st century environment that we would expect to shape the character of a contemporary ‘alliance’? Shaping factor #1 The nature of IR today: Not war and peace between several great powers, and not Cold War either (since there is no ideological competition) but a kind of subtle rivalry. Today’s rivalry is over economic interests, and is restrained as well as driven by economic factors – principally the interdependence that comes from the vastly increased importance of global trade and investment for national prosperity. But ideology is far too powerful a tool to be discarded overnight, and strategic interests are still wrapped up in symbolic use of ‘values’. E.g. Europe maintains a kind of (leaky) arms embargo on China since Tiananmen, largely at the behest of the US. Relations with Russia are currently undergoing a similar kind of renegotiation. Finally, the nature of international relations today (inter-connected, flatter) means that national power is distributed over several domains, and is less concentrated in the military instrument. It is also more mediated by intergovernmental or international organizations such as the UN, G8, etc. Shaping factor #2 The position of Japan and the UK in the contemporary balance of power: Today the in-balance of power offers a context for alliance that is very far from that which shaped the Concert of Europe and mid 20th century alliances such as NATO. One power (America) is orders of magnitude stronger than others in terms of aggregate power. Japan and the UK are middle powers in this system, and both allied to the hegemon. There are signs of a long-term shift towards a multipolar order where no one nation is dominant at all times in all places, and the movement of economic power towards Asia is the major factor in this. What implications would these shaping factors have on the contemporary character of an Anglo-Japan alliance? (a) a need to insure against the risk of dependence on a single large ally; (b) Support provided for defence will probably not be decisive in a confrontation involving a great power; (c) the destructive power of modern weapons means the strategic objective today is not winning wars but avoiding them. This puts a premium on understanding the perceptions and intentions of would-be opponents; (d) alliances will tend to be looser in that they are not as focused on one particular type of contingency. This is partly because all-out war is seen (right or wrongly) as either unlikely or so destructive to national prosperity that it is dangerous even to talk of it being a possibility, and partly because security interests are less concentrated on military instruments. As with the pre-1981 US-Japan security relationship, it may be that the UK and Japan have an alliance even though the UK that prefers to call it by another name (out of concern for the impact on economic relations with China); (e) You see more ‘packaging’ of alliance issues, with expressions of partnership encompassing diplomatic, economic and military components. How do these general shaping factors and their implications relate to the UK-Japan relationship? Paradoxically, the diminished capacity of the UK and Japan compared to the situation a century ago is no impediment to their relationship. Indeed, similar size can be good for an alliance relationship. When it comes to cooperation on capability development, playing with a much stronger partner can feel like an uphill battle. The fact that the UK and Japan are both middle powers means they can play on an even field. Also, the weak have a stronger incentive to band together, and close partnerships or alliances like this one provide a multiplier effect that is easy on stretched defence budgets. If anything, the diminished capacity of Japan and the UK probably just makes them savor their sense of sovereignty all the more. In spite of the fact that PM Abe is a firm supporter of the current Japan-US alliance, he also views Japan’s ‘post-war system’ as an American imposition he would like to erase. In particular, he wants to diversify Japan’s security partnerships across points in Europe (UK and France and NATO) and Asia (ASEAN, India, Australia). There is a feeling in the UK that subservience to the US has gone too far and Post-Blair Britain is especially sensitive to charges of being America’s Poodle. Exploring another type of alliance offers relief from these anxieties, as well as widening opportunities for trade and influence. Perhaps a bilateral alliance feeds both parties’ nostalgia for a time when their national identity was not overshadowed by their Uncle Sam. But for that same reason, describing the relationship as an ‘alliance’ can be a delicate matter. It would be natural if both the UK and Japan were conscious of not wanting to offend their main alliance partner, their relationship with the US gives them much in common. For Japan, the new type of alliance offers not an alternative alliance partner to the US, but a way to get a bit of insurance against the risks of abandonment. In Britain’s case, Obama’s ‘pivot’ and the macroeconomic trends driving it creates a need to re-think how to be strategically relevant in Asia. So developing security cooperation in the region is good for UK interests in general – and may even enhance the value of the UK-US relationship in the era of the ‘re-balance’. In fact there is hardly any cause for concern because the new type of alliance is good for the US in a number of ways; (i) it reinforces the value of interoperability with US forces and offers new avenues for developing shared analysis and understanding; (ii) it encourages mutual assistance among allies in the event of contingencies involving US interests in Europe, Asia and spaces between, thus reducing the burden on Washington; (iii) the difference in scale and capabilities between the US and its allies remains such that no-one can think seriously of this new type of alliance as any kind of alternative to the relationship they have with the US. Regardless, both parties may be signaling to re-assure the US that there is nothing to worry about here. No UK official has actually used the term ‘alliance’ yet to describe the relationship with Japan. The Japan side has, but only once or twice. In other words, the fact that few are calling the relationship an alliance may not be a good indicator that it is not worth the name. As shown by the uproar when Japan’s PM Suzuki started to call the US-Japan relationship an ‘alliance’ for the first time, there may be other reasons to avoid using the correct label (avoid offending the US and China). Absence of the term ‘alliance’ does not prove absence of the function ‘alliance’. Interestingly, the Japan side have floated the idea of a ‘Trans-Eurasian relationship’ a couple of times – once when RUSI opened its doors in Tokyo in 2012, then again in a speech this May 2 by the Japan’s Vice Parliamentary Minister for Defence Kihara Minoru gave a speech at IISS ‘Japan and UK as Strategic Partners – towards further co-operation in the defence field’. The implication may be that the world can be banded by three big relationships – the trans-pacific being the US-Japan alliance; the trans-Atlantic being NATO or the US-UK relationship, and the trans-Eurasian being the Japan-UK relationship. If the strategic objective of alliance today is not war-fighting but the avoidance of wars, this puts a premium on understanding the perceptions and intentions of other powers in order to avoid miscalculation and probe for opportunities to take advantage. The importance of understanding and intelligence-sharing is prominent in today’s UK-Japan relationship. A former UK Defence Attache in Tokyo once suggested to me that Japan has come to look to the UK as the ‘first choice provider of a second opinion’. Japan and the UK have new agreements to enable intelligence-sharing but also strategic assessments – as seen in the tie up between RUSI and NIDS since 2006. “In the same way that formal and informal economic and trading ties between nations, built up over time from the first trade delegation or first export order, gradually develop the cultural understanding and expert local knowledge that facilitate future economic links on a much greater scale … so the ties and channels of communication established from the steps of Defence Engagement – often small in scale and in uncontentious areas such as language training or military medicine – can lay the foundation for the deeper and more formal cooperation that develops greater mutual trust and understanding”. Now culture may not score a lot of points with the realists in the audience but when it comes to mobilizing a society behind an alliance relationship, it surely helps. There is the history of the previous Anglo-Japan alliance, though awareness of this in the UK is low. There is the link of monarchy and Japan’s Emperor studied at Oxford, not the Ivy League. Mutual respect has grown on the basis of culture, but extends also into the harder dimensions of national character. Both nations fought each other to a standstill over their Asian possessions but never came close to invading each other, and even the bitterness of POW issues is fading. This potentially puts the UK in a position to provide a rather unique kind of support for Japanese power. The UK-Japan relationship is a ‘good news story’ in terms of relations between former enemies who have put bad war memories behind them. In a way this facilitates the rehabilitation of defence and strategic thinking in Japanese society, which is otherwise cowed by reminders of its war guilt. Provided it is explored carefully, this could prove a powerful dimension of the alliance. Today international relations are more mediated than ever, and international organizations like the UN, G8, EU and NATO function in ways that have changed the role in the nature of ‘alliance’ in the 21st century. For Japan Britain can be an advocate for its interests in the major international organizations: UN Security Council, the EU and NATO. As Simon Chelton observed in his 2012 article in Wedge, the UK and Japan have – in terms of their voting record in the UNSC – more in common than either have with the US. Britain can offer access and advocacy if Japan would like support on Korean sanctions, free trade negotiations or enhancement of its relationship with NATO (Japan became a member of NATO’s Individual Partnership and Cooperation Programme during a recent visit by Abe to NATO headquarters in Brussels). Despite Abe’s dream of settling Japan’s territorial dispute with Russia, Abe recently joined the rest of the G7 in isolating Russia over its actions towards Ukraine. As for the future, the FPDA offers one access point for cooperation, as reflected in PM Abe’s appeal to join the arrangements as an observer. In case of contingencies nearer Japan, the UK is a member of the United Nations Command, Military Armistice Commission, Korea, which has its headquarters rear in Yokota airbase, Japan. More ideas for how UK-Japan cooperation fits into broader European geostrategies were raised in a recent article “Europeans reach out to Asia: the role of Japan” by James Rogers and Prof. Luis Simón. A more detailed study of the future potential of the alliance will follow in a later blog posting. Over the past few years, the UK and Japan embarked on systematic, direct and broad-based security cooperation that goes beyond a general ‘partnership’. Recent developments suggest these moves are likely to culminate in a broad security and defence relationship that deserves the name ‘alliance’. The nature of this relationship differs from that of past alliances, but in ways that are an appropriate reflection of changes in the relative and absolute position both nations occupy in today’s international security environment. Furthermore, an examination of the UK-Japan relationship helps focus on the factors that shape the concept of ‘alliance’ in the 21st century. This blog post was inspired by a round-table meeting at the United States Naval War College on European perspectives on the American ‘pivot’, organised by the John A. van Beuren Chair of Asia-Pacific Studies.